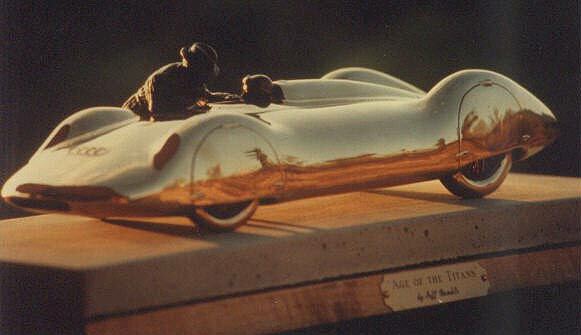 Bronze sculpture of the 1937 Autounion Record car with Professor Porsche and Bernard Rosemeyer. Size: Overall 20", Autounion 16.5" long. Weight w/base: Approximately 36 pounds. Finish: Polished Bronze, figures in patina, fully enclosed underside, complete wheels. Method: Each piece is foundry cast using the lost wax process to ensure quality and detail. Base: Concrete on Beechwood, typifying the Frankfurt to Darmstadt Autobahn and beech trees.